Job applicants come to the interview with the goal of giving you answers they think you want to hear – and it's much more difficult to ask a question that doesn't reveal a preferred answer than most people realize. Studies show between a quarter and a third of all job applicants misrepresent their job history during the hiring process. Probe an applicant's stated ambitions from a number of different angles to see if the answers are consistent and have depth of conviction. You want to start with a broad question about employee motivation that can't be answered with a simple yes or no – then ask increasingly specific questions that reveal detail. Always look for an internal consistency in the answers when going from generalities to specifics to get at the truth behind their initial answer. Listen for a tonality of candor. You'll frequently have to dig to get answers that are specific and meaningful, rather than answers that are general and vague. • What type of rewards – both monetary and non-monetary rewards – are most meaningful to you? • What aspect of your work life do you feel passionate about? • What have you done in the last year with your own time and money that would make you more valuable to our company? • When have you felt the greatest pressure to compromise your personal integrity? • What aspects of your career have not lived up to your expectations? • What are you looking forward to? • Describe for me a situation where self-centered behavior produced bad teamwork that was expensive for the company. How did you deal with it? • If you’d been the boss and wanted to solve the problem, how would you have done it? How would you have described the problem to the individual? What you're looking for here is conflict resolution skills. The more specific and objective a person can be in describing a behavior they've experienced as a problem with others, the greater their chances of resolving conflict. • Tell me about a time you’ve pulled the team together — how have you built morale? 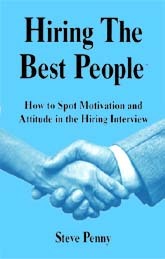 • When have people you were working with not been as honest or sincere as you would have liked? What did you do? Know how to evaluate what you hear about motivation and attitude in the workplace with fresh interview questions job applicants won't have rehearsed answers for. No Decision is More Crucial to the Success of Your Business Than Making the Right Hire! For 7 Ways To Motivate People That Don't Cost a Penny on Non - Monetary Rewards in the Workplace.